Why do we say in the Liturgy: "Most Holy Theotokos Save us"? When we speak of eternal salvation, we understand that only God can save us. Why then do we chant in various Services of our Orthodox Church, “Most Holy Theotokos Save us’? Most commonly, we hear this supplication in the Paraclesis and Salutations Services to the Theotokos and ever-virgin Mary. The bond between mother and child is mysteriously close. The bond between the Theotokos and Christ is unprecedented. It is a one-time miraculous event in God’s plan of Salvation for all humanity. Therefore, the Theotokos is the only one who has this unique connection to our Savior through her unwavering faith, willingness and obedience providing humanity to our Lord in His incarnation. It is for this reason that we can ask her to speak to her Son to save us from eternal sin and death. Father Paul Kaplanis graduated from Western Connecticut State University in 1979, with a B.S. Degree in Social Science and History. In September 1979, he entered Holy Cross Greek Orthodox School of Theology. In 1983, he graduated with his Master’s of Divinity Degree and upon receiving the Taylor Scholarship, Father Paul enrolled in the Master’s Program at the University of Thessaloniki, Greece. 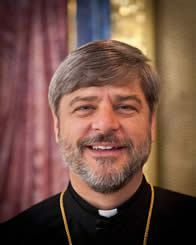 Father Paul is now the Dean of the Greek Orthodox Cathedral of the Annunciation in Atlanta, Georgia.